We've thoroughly updated our guide to connecting your iPhone or iPad to your HDTV, because when you’re trying to show off photos, videos, and other visual content from your iPhone or iPad, there are too many times when the small screen just won’t do. 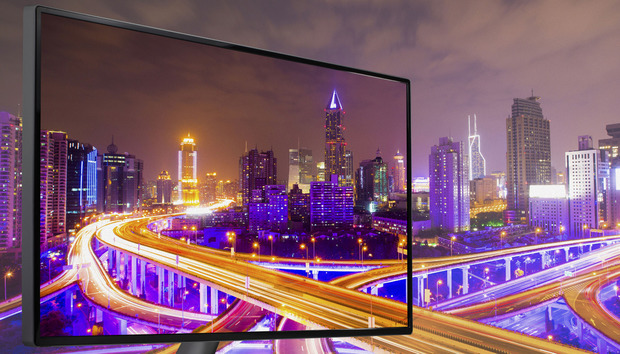 Fortunately, there are several ways to connect those devices to the biggest screen your home: Your TV. You don’t even need a fancy smart TV to do it. We’ll show you several easy methods, ranging from using a basic HDMI adapter to sophisticated wireless streaming. Setup is easy: Just plug the HDMI cable into your TV on one end and the adapter on the other, plug the Lightning cable into your iOS device, and set the TV to the appropriate input. You can also plug a charger into the adapter’s second Lightning port to keep your iOS device’s battery from draining. Most apps will simply mirror the iOS device’s display onto the television, but video apps such as Amazon Prime and Netflix might offer persistent playback controls while the video plays on the TV. Some other apps, including Hulu, go a step further and let you browse their catalogs while the video is playing. Some apps, such as Hulu, let you browse while video plays on TV. For users of older iOS devices, a 30-pin-to-HDMI adapter is available, though Apple does not carry it in its stores as of this writing. It’s still available through other retailers, such as Best Buy, for $40. If you’d rather not deal with wires, you can also stream video and audio to any Apple TV ($149 for the 32GB model) using the wireless AirPlay protocol. This allows you to either mirror your iPhone or iPad display on the TV, or beam video and audio from within supported apps. Apple TV’s AirPlay Mirroring feature lets you screen-share from any iOS device. Ensure that both the Apple TV and iOS device are on the same Wi-Fi network. On the iOS device, swipe up to reveal the Control Center. Tap the “AirPlay Mirroring” button. To disconnect from the TV, follow steps 1 through 3, and then select “Turn Off AirPlay Mirroring” from the list. Keep in mind that with many video and audio apps, mirroring isn’t necessary. Instead, you can just tap the AirPlay icon during audio or video playback (it looks like a TV with a triangle at the bottom), and then select your Apple TV from the device list. This consumes less battery than mirroring, and it allows you to use the iOS device for other tasks while music and video play on the television. Most video and music apps support AirPlay without mirroring. Just look for the icon during playback. Apps that support Chromecast let you play content on the TV from iOS devices, Android devices, and the Chrome browser. Just look for the Chromecast icon. After plugging the Chromecast into your television, use the Google Home companion app to connect the device with your wireless network. You should then see the Chromecast icon appear in supported apps. Tap on it, and then select your Chromecast from the device list. Once you begin media playback, it will appear on the television instead of your iPhone or iPad. If you don’t have an Apple TV, you might still be able to send photos, videos, and music stored on your iPhone to the big screen with a free app called AllCast. This app works with any device that supports DLNA rendering, including Chromecast, Amazon Fire TV, Xbox One, Xbox 360, Roku, and various smart TV platforms. 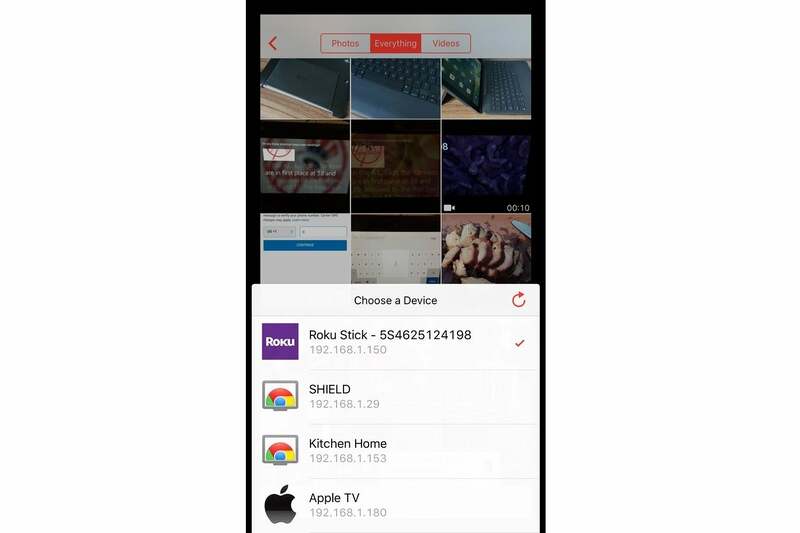 Allcast is helpful for viewing your phone’s media files on a wide range of streaming TV devices. 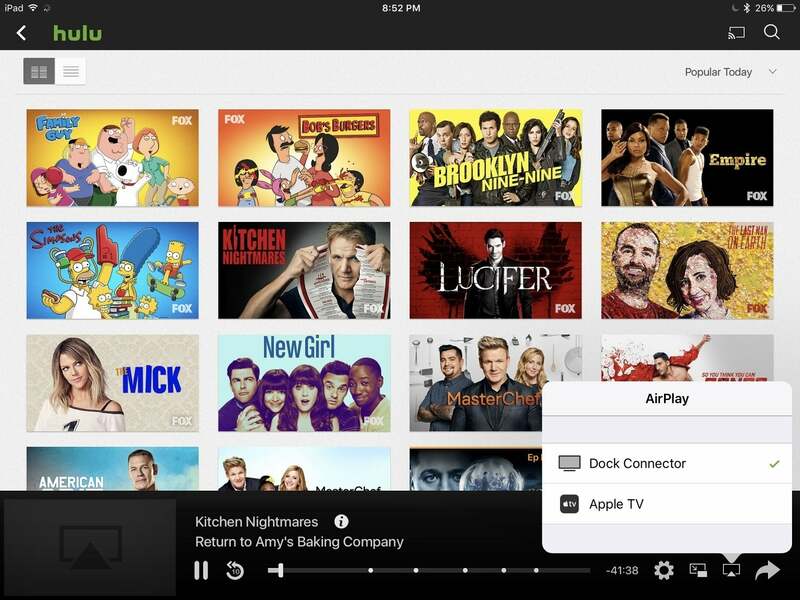 Once installed, AllCast will detect any TV devices that are powered on and connected to the same network as your iOS device. Just press the Cast button in the bottom-left corner, select the device to play on, then choose the media you want to send to the TV. Although the app’s basic function are free, a $5 in-app purchase removes advertisements, splash screens, and limits on video length.